What Happens When You Don’t Check Your Teeth-Grinding? Unless your teeth are already sensitive, worn down, and/or damaged, you might not consider grinding your teeth a significant concern. However, when left unchecked, chronic teeth-grinding (also known as bruxism) can become one of the biggest risks to your long-term oral health. At our Lafayette, LA, dental office, we can diagnose your bruxism and the specific cause of it during a comprehensive oral examination. Then, we can help you check your teeth-grinding habit by designing an appropriate treatment plan to help you stop, and to repair any tooth damage that may have resulted from it. Your mouth is the most-often used part of your body, and your teeth are protected by the most resilient substance that your body produces (enamel). However, when your teeth are consistently forced to grind against each other, then they can quickly wear down each other’s chewing surfaces due to the friction. The longer you allow your bruxism to continue uninhibited, the more your teeth will wear down, making them weaker and changing the way your bite functions. By the time you seek treatment, one or more of your teeth may be so significantly worn or damaged that you need an appropriate restorative plan to fix them. If you’ve already had one or more of your teeth restored, such as with a tooth filling or custom dental crown, then the presence of bruxism can compromise its success, as well. Modern tooth restorations are also highly durable, but they’re not indestructible, either. The pressure and friction of bruxism can crack or break your restoration, which can leave the underlying tooth structure exposed to further decay, damage, or more. Before placing a restoration to fix a worn or damaged tooth, we may suggest using a custom-designed appliance to protect your teeth from grinding together while you sleep. Besides your healthy tooth structure, the pressure and friction of bruxism can also place other components of your bite at risk, such as the joints that allow your jaw to move. Known as temporomandibular joints (TMJs), the joints are located at the temporal bones on either side of your jaw. 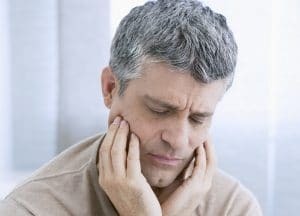 If they’re overworked, stressed, exhausted, damaged, forced out of alignment, develop inflammation, or more due to bruxism, then the resulting TMJ disorder can lead to increasingly worse aches, pains, and bite dysfunction. If you ignore a teeth-grinding problem long enough, then you’ll have several more extensive issues to deal with by the time you do seek treatment. To learn more, or to schedule a consultation, call the office of Michael J. Young, DDS, in Lafayette, LA, at 337-237-6453. We proudly serve patients who live in Breaux Bridge, Broussard, Scott, Youngsville, and all surrounding communities.